At BRS, every order over $29 ships free using a mix of economy shipping methods including, USPS First Class Mail, SurePost and UPS Ground. 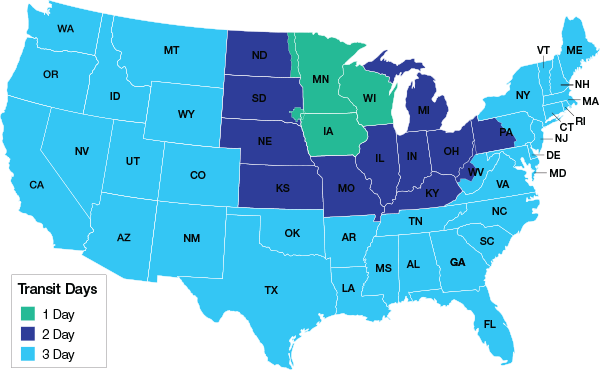 Your order will arrive within 2-7 days, depending on your proximity to Minneapolis, MN. Place your order by 3:30 PM CST Monday through Friday and we'll ship it the same day. This offer is only available in the 48 contiguous US. Frozen foods and post office boxes do not qualify for free shipping. Packages will be shipped with the most economical method but for your reference generally follows these guidelines. Packages under a pound are likely to be shipped first class mail, 1-7 pounds surepost and over 7 pounds UPS ground. Offer valid only in the 48 contiguous US, frozen foods, US. Freight and drop shipments such as larger tanks, sumps and tank systems do not qualify. Free shipping promotion for limited time only, does not apply to expedited shipment methods, PO Boxes, or frozen foods. Not valid for wholesale customers. Orders over $29 will have an option during checkout to upgrade to 1-3 day Fast Flat Rate Shipping that uses a mix of UPS 3 Day Select & UPS Ground. The Fast Flat Rate upgrade price ranges from $2.99 for orders under 20 pounds, $3.99 for orders 21 to 40 pounds, and $4.99 for orders over 41 pounds. Orders under $29 can upgrade to 1-3 day Fast Flat Rate Shipping for $4.99 regardless of the weight. Place your order by 3:30 PM CST Monday through Friday and we'll ship it the same day. This offer is only available to the 48 contiguous US, drop ships, and post office boxes do not qualify for upgraded shipping. Offer valid only in the 48 contiguous US, frozen foods, US. Freight and drop shipments such as larger tanks, sumps and tank systems do not qualify and are indicated as freight or drop shipping in the product description. Free shipping promotion for limited time only, does not apply to expedited shipment methods or frozen foods. Not valid for wholesale customers and some exclusions may apply. If your order is under $29 shipping is only $2.99 and will use a mix of USPS First Class Mail, SurePost, and UPS Ground. 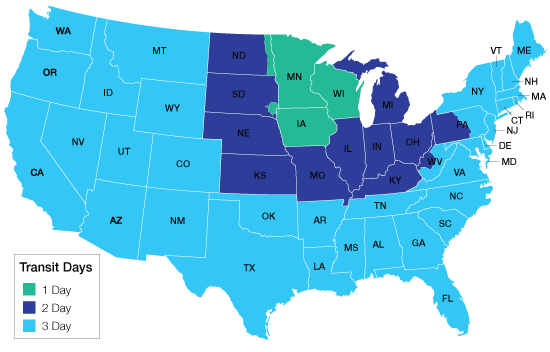 Your order will arrive within 2-7 days, depending on your proximity to Minneapolis, MN. Place your order by 3:30 PM CST Monday through Friday and we'll ship it the same day*. This offer is only available in the 48 contiguous US. Frozen foods and post office boxes do not qualify for free shipping. Packages will be shipped with the most economical method but for your reference generally follows these guidelines. Packages under a pound are likely to be shipped first class mail, 1-7 pounds surepost and over 7 pounds UPS ground. Some exclusions may apply. We guarantee that all orders placed before 3:30 pm (CST) Monday - Friday will be shipped the same day your order is processed. If for any reason, your order does not ship complete, we will automatically upgrade the affected account to Preferred Reefer, and credit the account with $20.00 (2000 BRS Reward Points) that can be used on any future orders with BulkReefSupply.com. This guarantee is only valid for orders shipping within the 48 contiguous US and is valid for a limited time only. Excludes frozen food, pre-orders, drop-ship items, wholesale, and orders being shipped to Canada. Some exclusions may apply. Bulk Reef Supply now offers FLAT RATE shipping on all frozen foods. From 1 blister pack to 100 flat packs, shipping to any destination in the 48 contiguous US shipping is only $29.99. At this time we are unable to ship any frozen food to Canada, Alaska, Hawaii, or any US territories. We ship frozen food orders Monday through Thursday* with UPS Next Day Air delivery to ensure safe arrival and freshness. If your order contains more than frozen food, all other items will be processed as normal with an instant shipping upgrade to our Fast Flat Rate shipping method and will arrive in 3 business days or less. Orders ship free using a mix of UPS Ground, SurePost and USPS. Your order will arrive within 2-7 business days, depending on your proximity to Minneapolis, MN. Place your order by 3:30 PM CST Monday through Friday and we'll ship it the same day. This offer is only available in the contiguous US. USPS and expedited shipments do not qualify for free shipping. For free shipping choose the free shipping option at checkout (excludes frozen food). Select one of our Fast Flat Rate shipping options, and your order will arrive at your door within 3 business days or less in the contiguous US. Place your order by 3:30 PM CST Monday through Friday and we'll ship it the same day. Check the UPS map for your location. Bulk Reef Supply can accommodate order change requests prior to the order being placed into an "In Picking" status. Typically, orders are picked approximately one hour after being placed. Our warehouse team works hard to ensure that all orders placed before 3:30pm CT M-F are packaged and shipped the same day. In order to achieve this, orders can no longer be modified once they have begun the picking process. To find out the current status of any order all you'll need to do is log in to your BRS account and take a look at your current order status. Bulk Reef Supply currently ships to the US and Canada only. All Canadian orders received before Monday at midnight CST are shipped via UPS on Tuesday, and orders received before Thursday at midnight CST are shipped via UPS on Friday. They are shipped together on Tuesday & Friday to utilize a program which reduces brokerage fees and allows us to prepay all of the taxes, duties, and fees for you so there are no surprise charges at your doorstep. There is an 18% charge assessed at checkout to cover these costs. The 18% charge is based on the port of entry our shipments pass through Canadian Customs and not the "ship to" address. 18% covers an average of the brokerage charges, GST/PST/HST, fees and the duties required on the wide variety of products we ship to Canada. The net cost of this may exceed 18%; in this case, BRS will cover the difference at no expense to you. Please note all prices on BulkReefSupply.com are in US dollars, not Canadian. Canadian orders are not eligible for any free shipping offers. We are unable to send some items to Canada (all fish or coral food, as well as Pukani, Tonga, Fiji, shelf rock, etc). If these items are on an order they will be canceled and refunded. For shipping we use UPS and USPS services and over the years they have proved to offer superior service with exceptional on-time rates with very minimal damage. In most cases, packages shipped with UPS will end up to your doorstep in less than 4 days while USPS can take up to 7 days, but is much more economical for smaller packages. Both carriers have excellent on-time rates, however, during large storms, natural disasters, or other unforeseen circumstances deliveries may be delayed and will be noted by UPS or USPS when viewing the tracking information. We are unable to compensate for delays unless UPS Next Day or Second Day services are selected as the shipment method for the order. UPS will deliver packages Monday through Friday and USPS will deliver Monday through Saturday (may vary depending on your location). Due to the elevated risk of credit card fraud, customs issues, damaged shipments, and warranty issues, BulkReefSupply.com does not allow shipping to freight forwarding services. We reserve the right to cancel all orders shipped to freight forwarders/holders without notice. Any order shipped to freight forwarding or holding facility will not be eligible for any support. Customer pickup hours are available at our warehouse Monday - Friday 10am - 4pm. Customers who wish to pick up their orders at BRS will need to select the local pickup shipping option during checkout or contact the customer service department at 763-432-9691 and request a local pickup. Orders can then be picked up 1 business day after order is received.